Charts are one of the most important parts of Microsoft Excel. It helps us to present our data in an understandable manner. In Excel, we have different kind of charts to present our data in different ways. Even there are a lot of advanced charts and graphs which we can create in Excel by making small amendments in default charts. Now the bad news is, most of the Excel users don’t explore charting techniques much. But you can learn to create all those charts with little extra efforts. The benefit of using advanced charts in Excel is they are focused on a specific kind of data and make it more understandable. Today in this post, I have a list of Top 10 Advanced Excel Charts and Graphs, just for you. ...any further ado, let’s get started. A step chart is an extended version of a line chart. It’s is perfect to use when you want to show the changes happened on irregular intervals. Unlike line chart, it doesn’t connect data points using a short distance line. In fact, it uses vertical and horizontal lines to connect the data points. Helps to show the exact time of change. Gives the real trend of the data throughout the period. In a line chart, it’s not possible to show the constant period but in a step chart, you can present this. Shows you the actual numbers of the changes happened in a period. Milestone chart also knows as timeline chart. It’s one of the favorite charts of project managers and help them to track their project’s progress in a simple way. It’s just like a time in which each stage of the project is captured with the date of completion. It’s simple to create and easily understandable. A waffle chart is more likely a square pie chart. It’s a bunch of 100 small squares where one square represents the 1% of the total value. I’m sure you have seen it in dashboards and news article graphics. And, to create it we need to use conditional formatting. Best for single point target vs. achievement. Easy to create and simple to understand by the user. When it comes to showing the comparison of different things with each other tornado chart can be useful for you. It looks line a real tornado where large items are on the top and lowest at the bottom. And, each item has an opposite item for comparison. Can easily compare items for two different time periods. Also figures out the top and bottom items. 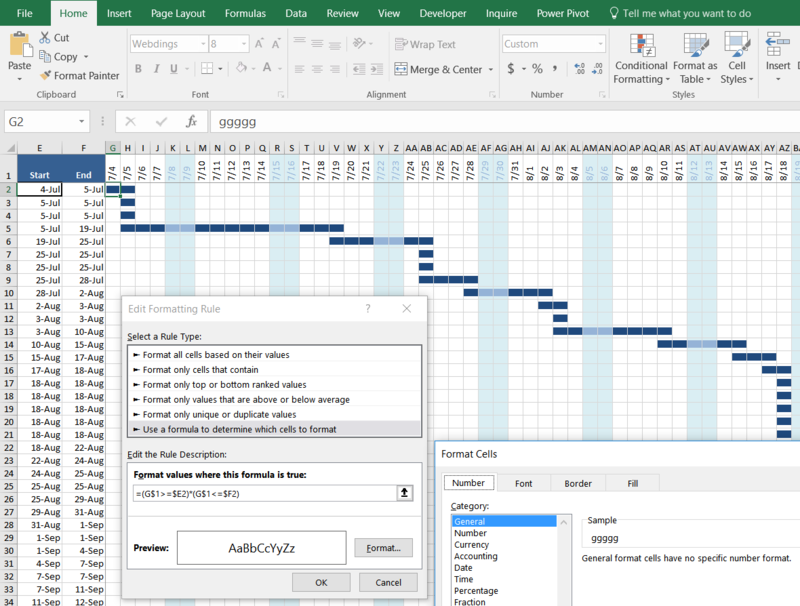 Gantt chart is one the most useful chart for project managers. It can help us to track project’s progress. Unlike a milestone chart, a Gantt chart can track completion days, delayed days, days pending, totals days, etc. In short, it’s complete chart to track your projects with all the important details which everyone requires. It’s a complete chart with all the details to track a project. It makes it easy to take a decision and we can review our project plan regularly in order to locate conflicts or other problems. A bullet chart is just like a column chart but instead of multiple columns here we have only one. It can help us to track a single point target vs. achievement. A target marker to represent the target. An achievement bar to represent the actual value. A comparison range which for the color theme. Best chart to track a single point target vs. achievement. It serves as a replacement for dashboard gauges and meters. A thermometer chart is another useful chart to track a single point target vs. achievement and can help us to present our data in an understandable way. It looks like a thermometer where entire chart presents the target and filled part is the achievement. The filled part goes up as the achievement increase. It’s simple to understand and easy to create. It’s a perfect chart to use in dashboards. It’s a kind of thing which you can find in your day to day life [Just look at the SPEEDOMETER in your car]. It's also known as a Gauge chart. It can help you to present single point data in your dashboard and KPIs. It’s easy to create and simple to understand for users. A population chart is a two-sided bar chart which helps us to compare the population of different age groups of genders. While comparing two items you can easily understand which group is growing. We can also use it to compare items for two different time periods. A pictograph is not a separate kind of chart. By creating a pictograph we can use an image in a chart to make it more presentable. Just like we have used a icon in the below chart to present the number of employees in a company in different age groups. Using a picture in a chart makes it more meaningful. It helps us to take our charting skill to a whole next level. Advanced charting techniques are one of those things which differentiate Experts from novice Excel users. As I said by using advanced Excel charts make your data more focused and easily understandable. You can also use them in your dashboards and templates to make them more effective. I hope the list of charts which I have shared with you will help you to get better at charting but now you have to tell me one thing. Do you have any other chart which you use frequently in your work? Share with me in the comment section, I’d love to hear from you and please don’t forget to share this list with your friends. I’m sure they will appreciate it. Your Excel tips are excellent. Which type of Chart is suitable to show student’s progress termwise. How can I use speedometer chart in my teaching profession. I mean what could be possible areas to use speedometer chart. While it is all still highlighted, go to Conditional Formatting and simply set it up so that when it fires (the date in the top row is in the range of your start and end dates) all that will happen is the cell’s font formatting will be set to General. No color changes or other formatting is needed. Whenever a cell that is in the same column as a date that is in the range of your start and end dates for that row will allow the bar to be seen. As always, thank you for your excellent site and I look forward to many more tips and tutorials. @plastic_cup:disqus Thanks for this great idea. Let me try this.